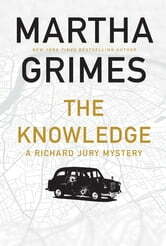 The Knowledge is the 24th book in Martha Grimes’s New York Times bestselling Richard Jury mystery series. We are thrilled to have the chance to publish such a major and beloved voice in the mystery world and have committed to this series with a two-book deal. Grimes has sold over 10 million copies of her books in the United States alone and has been published in 17 countries. Her novels regularly hit the New York Times bestseller list. Grimes was the recipient of the Grand Master Award of the Mystery Writers of America in 2012. She has also won the Nero Wolfe Award for best American mystery (for The Anodyne Necklace). Though an American, the life-long Anglophile Grimes sets her most successful series in England centered around Scotland Yard detective superintendent Richard Jury. The Jury mysteries are wry updates on the British cozy mystery style—real violence and sexual tension raise the stakes on the genre’s intellectual games, eccentrically refined characters, and charming British settings, all of which Grimes pulls off with charming expertise. For fans of Donna Leon, Elizabeth George, Louise Penny, and PD James. Grimes, a single mother who taught English at Montgomery College for years while she tried to write, didn’t submit the first Richard Jury mystery, The Man with a Load of Mischief, until she was in her 40s. A dozen houses rejected the novel before Little, Brown published it in 1981. Each of the Richard Jury mysteries is named after a pub that features in the novel, and “the Knowledge” refers both to the test that London cab drivers have to pass to become cabbies, considered one of the hardest tests in the world, and the off-the-grid pub Grimes invents that only cabbies can find. Outside of her Richard Jury series, Grimes has also published a send-up of the publishing world, called Foul Matter, and a sequel, The Way of All Fish, as well as a 2015 memoir co-written with her son: Double Double: A Dual Memoir of Alcoholism. 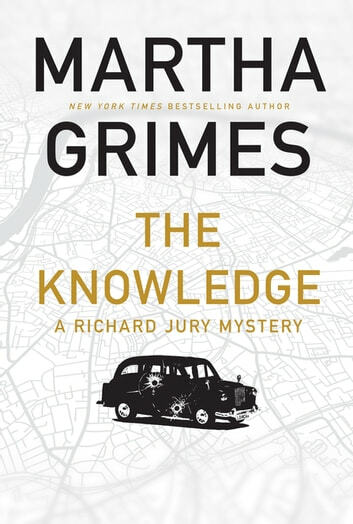 Thank you to Grove Atlantic, Atlantic Monthly Press and NetGalley for an advance e-galley of The Knowledge by Martha Grimes in exchange for an honest review. This is the 24th murder mystery in the Richard Jury series. However, since this is a first in the series for me, I can approach it on its own individual merits. This can easily be read as a standalone. Richard Jury is a Scotland Yard sleuth and The Knowledge is the name of a London pub frequented by black cab drivers only. The book begins with the murder of a married couple outside of an elite art gallery/casino. The crime is witnessed by a cab driver who, in turn, is kidnapped. The storyline takes us from London to Africa and back again, introducing new characters as it progresses. This novel reads like a cozy mystery because the characters are not always credible and sometimes confuse the story. I did enjoy The Knowledge and would like to read more of Martha Grimes' previous novels. I have followed Martha Grimes from the beginning. This book is like coming home again,and as life has a way of disrupting old habits, I find I have a few stories to catch up. Not many, but enough to find comfort and pleasure. I must add that I laughed my way through Lord Ardry’s safari. For a gentleman who gave up his Tittle, he is quite able to wear it when he chooses. Loved this book. Martha Grimes writes the most witty and entertaining books every time. Her eccentric characters and plot twists produce a winning combination. Hope there are many more.